She is used to rubbing shoulders with red carpet royalty at Hollywood events but tonight Anne Hathaway was in the presence of a real life Princess. The actress, 28, spent time with Princess Charlene of Monaco as the pair attended Princess Grace Awards Gala in New York. While the Princess, 33, had donned a dramatic floor length lace Christian Dior gown with beading, draping and a floral pattern detail Anne kept things simple. She stepped out in a midi-length shift dress which boasted jewelled detail but kept her tones muted sticking to a pale champagne colour. The Batman actress teamed the dress with bright red lips, rosy cheeks and dangling diamond earrings. Meanwhile the royal former swimmer showed off an elegant curled up hairstyle with dangling earrings and a hard clutch. 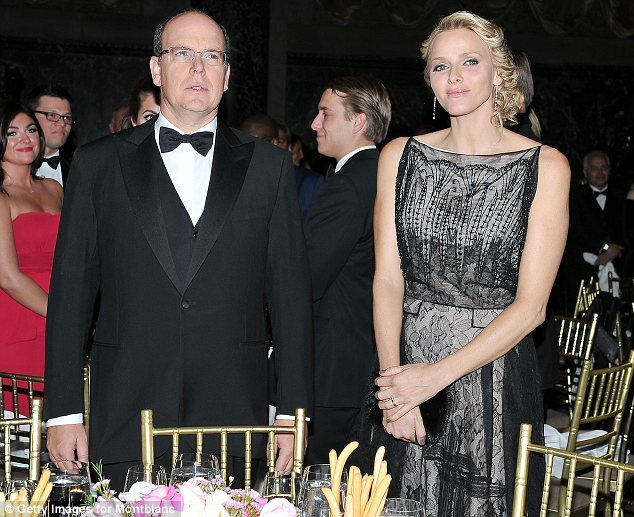 The Princess was joined by her husband Prince Albert II, who is Vice chairman of the national foundation which is dedicated to helping emerging talent in dance theatre and film. Former reality TV star Olivia Palermo also made and appearance at the event with her model boyfriend Johannes Huebl. The usually on-trend former The City star wore an oversized peach ensemble which hung off her slim frame. Model Selita Ebanks and Petra Nemcova, and singers Martha and Rufus Wainwright also attended the glamorous party. The bash attracted a whole host of famous faces from the screen and stage and Princess Charlene was on hand to welcome guests at the event held at Cipriani in New York. 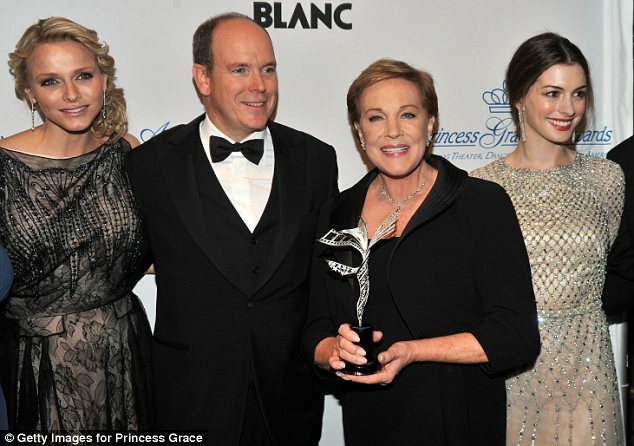 She was seen extending a warm hand to Julie Andrews who had donned an all black dress with white gloves for the evening. Miss Hathaway also played a part in the event and spoke to guests as she took to the stage.